By Matt Goodman | 2 years ago Workplace design has never been so important. If you need proof, look at retention, recruitment, and productivity at companies that did their offices right. By Joseph Guinto | 2 years ago As an activist investor, the CEO once took shots at struggling companies. Now he's experiencing life on the other side. 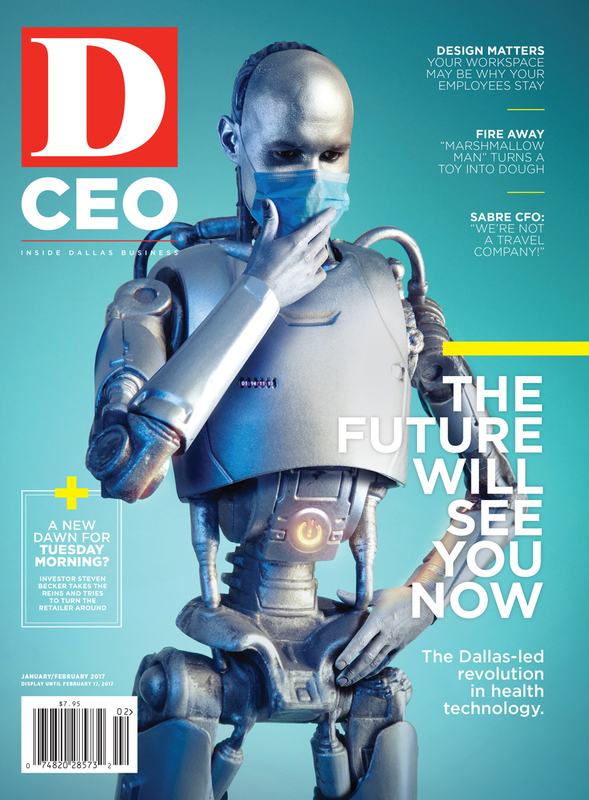 By Danielle Abril | 2 years ago There's big money to be made, and these North Texas entrepreneurs, health systems, investors, and companies are raking in the returns. By As told to Jessica Abernathy | 2 years ago The chairman and CEO of StackPath on selling new technologies. By Carly Mann | 2 years ago From meetings to Happy Hour, take a look inside the Texas Capital Bank president and CEO's schedule. By D CEO | 2 years ago The president and CEO of FedEx Office shares his toughest challenge. By Danielle Abril | 2 years ago Masergy CEO Chris MacFarland explains how the networking-solutions company pulled off its latest, $900 million-plus private equity coup. By Hamilton Hedrick | 2 years ago The Saint Bernard Sports COO shares how his work reflects and influences his wardrobe. By Molly Wolchansky | 2 years ago The founder, chairman, and CEO of U.S. Risk Insurance Group spends his weekend mornings cooking breakfast in the kitchen he designed. By Steve Kaskovich | 2 years ago For one, they're highlighting the things you can't do online. By Christine Perez | 2 years ago Dallas private equity exec Ari Rastegar believes a big economic downturn is looming, and he’s gearing up for just that. By Molly Wolchansky | 2 years ago The entrepreneur followed his gut, transforming a marshmallow shooter into a successful venture. By Glenn Hunter | 2 years ago The executive vice president and CFO of Sabre Corp. talks business models and what's next for the company. By Matt Goodman | 2 years ago The hidden effect beats out cancer and heart disease. By Glenn Hunter | 2 years ago The business model is new but increasingly popular. By Kerry Curry | 2 years ago Foodborne illness concerns aligned with new safety regulations could mean growth for the Dallas-based company. By Glenn Hunter | 2 years ago The newly named president and CEO of the North Texas Commission will help shape perceptions of Dallas-Fort Worth's business community. By Christine Perez | 2 years ago Construction cranes are flying high throughout North Texas. Here’s a look at some of the notable new projects under way. By Christine Perez | 2 years ago From the Cowboys' new home to the Uptown office race, here's our take on the industry's top stories and five things to watch in 2017.